The Long March 7 rocket, tailored to send medium-class payloads into low Earth orbit, will become a centerpiece in China’s new family of launch vehicles that will eventually replace the country’s aging decades-old rocket designs. 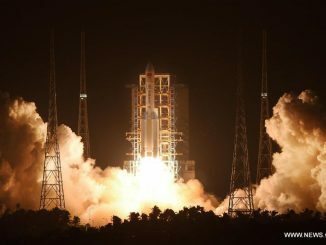 The launch window opens Saturday and extends through Wednesday, according to the China Aerospace Science and Technology Corp., the Chinese space program’s state-owned prime contractor. Chinese officials have not officially disclosed a target launch date or launch time, but a notice to mariners in the South China Sea pointed to a launch window each day opening at approximately 1200 GMT (8 a.m. EDT). The 174-foot-tall (53-meter) rocket rolled out of its vertical assembly and test building Wednesday. Mounted on top of a mobile launch table, the Long March 7 made the 1.7-mile (2.7 kilometer) journey in about three hours, the China Academy of Launch Vehicle Technology said in a statement. China’s official Xinhua news agency reported Friday that all preflight tests on the Long March 7 have gone smoothly. Citing a deputy chief designer of the rocket, Xinhua said engineers have verified the Long March 7 airframe is airtight and completed testing of the rocket’s power system. “Checks on the measurement and control systems will also be carried out to ensure the proper operation of its electrical systems,” Xinhua reported. The payloads aboard the Long March 7’s first flight have not been announced, but the rocket reportedly will deploy a sub-scale prototype crew capsule for an unmanned test flight, along with several small CubeSat-class satellites. 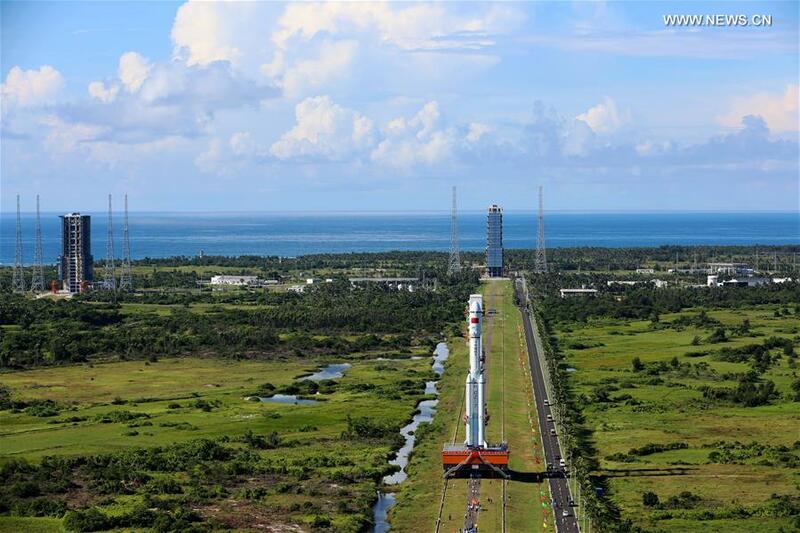 The Long March 7 will blast off from a launch pad at the new Wenchang Satellite Launch Center, a facility spanning nearly 8 square miles (20 square kilometers) on the northeast edge of Hainan Island, which lies just south of the Chinese mainland. Maritime advisories indicate the rocket will head southeast from the seaside launch pad on Hainan Island, dropping its four liquid-fueled boosters into the South China Sea. Built between 2009 and 2014, the launch center sits at 19 degrees north latitude, closer to the equator than any other Chinese rocket base, giving China better access to place satellites in geostationary orbit. Wenchang has two launch pads, each about 2,000 feet — 600 meters — from the beach. One of the launch pads is devoted to the Long March 7, while the other will host launches by the larger heavy-lift Long March 5 rocket due for its maiden mission later this year. The launch site also has assembly buildings for vertical stacking of the rockets. The larger of the two rocket hangars, designed for the Long March 5, stands more than 30 stories (about 99 meters) tall, according to Xinhua. 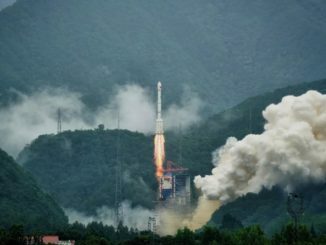 The two newly-developed rockets — along with the light-class Long March 6 rocket successfully demonstrated last year — will replace China’s existing Long March launcher families, which are rooted in antiquated technology stemming from the country’s first foray into spaceflight in the 1970s. The Long March 6 is the smallest of the bunch, capable of catapulting small satellites into low-altitude orbits. It successfully flew for the first time in September 2015, demonstrating the YF-100 engine to fly on the Long March 7 during a real launch. The old rockets consume a toxic mix of hydrazine and nitrogen tetroxide propellants. Both chemicals are hazardous to the environment and to humans. The new generation of booster engines burn cleaner kerosene and liquid oxygen, and flights from Wenchang go over the ocean instead of jettisoning spent rocket segments over land, as is the case at China’s other launch centers. State media reported all the hotel rooms in Wenchang — enough for 80,000 people — are booked for the Long March 7 launch. Authorities have set up eight viewing areas for space enthusiasts to watch the launch, Xinhua said. 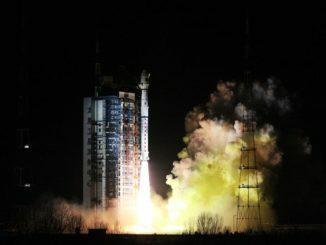 The Long March 7 rocket is capable of putting a payload of nearly 30,000 pounds — about 13.5 metric tons — into low Earth orbit, and more then 12,000 pounds — 5.5 metric tons — into a sun-synchronous polar orbit up to 435 miles (700 kilometers) in altitude. The Long March 5 scheduled to fly later this year nearly doubles that capacity, with the ability to place a 55,000-pound (25-metric ton) spacecraft into low Earth orbit. The Long March 7’s four liquid-fueled strap-on boosters are each powered by a single kerosene-fed YF-100 engine. The launcher’s first stage is propelled by two of the YF-100 powerplants, each producing about 270,000 pounds of thrust at sea level. The Long March 7 could fly with an upper stage to place satellites into high-altitude orbits or on Earth escape trajectories. Space program managers intend for the Long March 7 to launch resupply ships to China’s future space station set to enter service in 2022. China’s first Tianzhou cargo capsule, analogous to Russia’s Progress resupply freighter, is expected to launch from Wenchang on a Long March 7 next year and dock with the Tiangong 2 space lab, a precursor mini-space station scheduled for liftoff in September. Like its predecessor Tiangong 1, which hosted Chinese astronauts in 2012 and 2013, the new space lab module will blast off on a Long March 2F booster from the Jiuquan launch base in northwestern China. A two-person crew is supposed to launch on the Shenzhou 11 spacecraft as soon as October for a 30-day visit to the Tiangong 2 research and test lab. 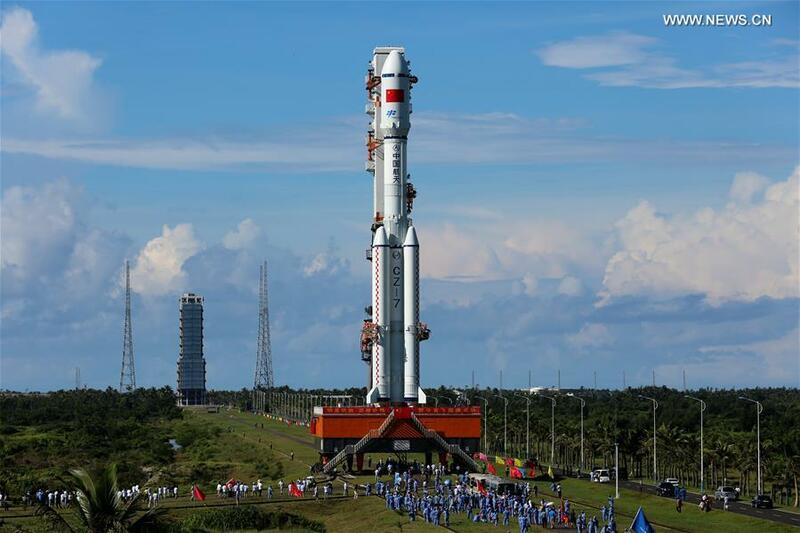 That will be China’s longest-duration human spaceflight yet. With a steady sequence of Long March 5 and Long March 7 launches, Wenchang’s launch pads should stay busy in the coming years. The Long March 5 rocket is assigned to send a robotic sample return mission to the moon next year. It will also put up massive modules to form the building blocks of China’s space station. Chinese crews on near-term missions are still expected to launch from mainland China.